My friend Amanda tweeted this verse this morning and it was SO timely!!! I wanted today to be a post all about prayer requests . I just have a few to share with you - and I LOVE this verse above! First of all - I've recieved several emails about this sweet little girl Lucy (love her name!). 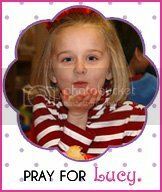 She was diagnosed with medulla blastoma, a form of brain cancer. She had 3 tumors on her brain, one one her spine, as well as a "sugar coating" of cancer running down her spine. After this dangerous surgery is completed, she will then undergo chemo and radiation at St. Jude in Memphis. Nothing makes me more sad than children and cancer. You can keep up with her on her family blog: http://erikandkatekrull.blogspot.com/ Please pray for this family: http://kandjstaats.blogspot.com/. Their 4 month old daughter, Madison, recently passed away at her babysitter's house. She had been napping. I can't imagine - I know they could use our prayers. There is a little boy TY who was born in Little Rock a few months before Harper. He had a very rough start - spent a lot of time in the NICU and had several surgeries. Just recently he was diagnosed with stage 4 High Risk Neuroblastoma. You can follow his journey here and pray! A year ago I shared the story of Zac Smith - a man who had stage 4 cancer who wanted to glorify God in his life and his death. He did pass away but I heard from his sweet wife Mandy recently and she shared this video with me. I love this and wanted to share with you. A Story | Tears of Hope from NewSpring Media on Vimeo. Please share any prayer requests you might have in the comments.